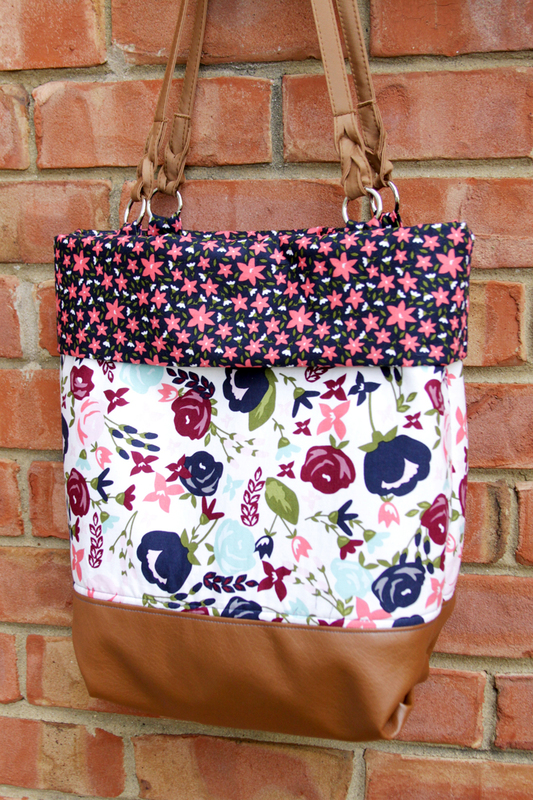 It has been ages since I made a new bag, I was definitely overdue! 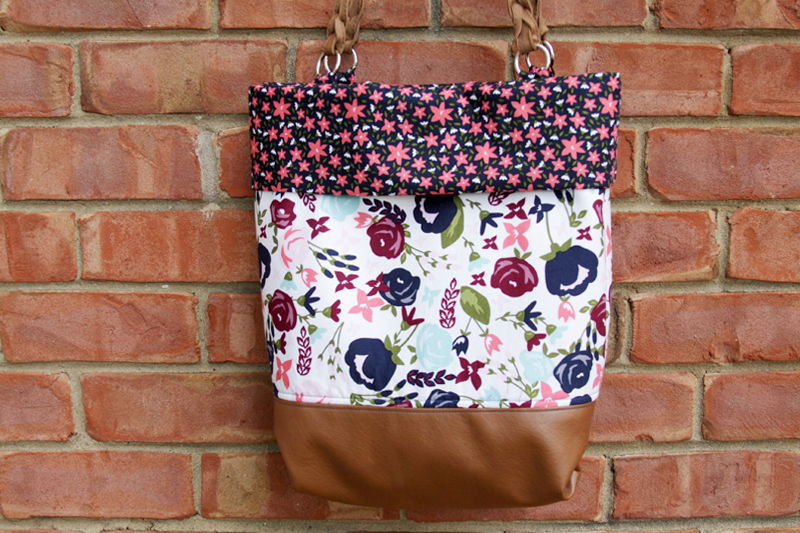 This new fabric from Riley Blake – Posy Garden – is so cute and I thought it would be perfect for my new DIY Posy Garden Leather and Fabric Tote! 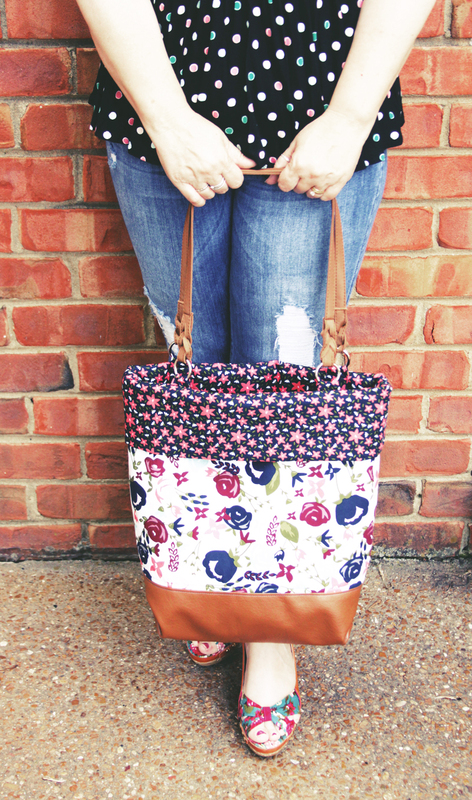 This cute tote goes together pretty quickly, you can make it up in just a few hours and have a fun new accessory that same day! 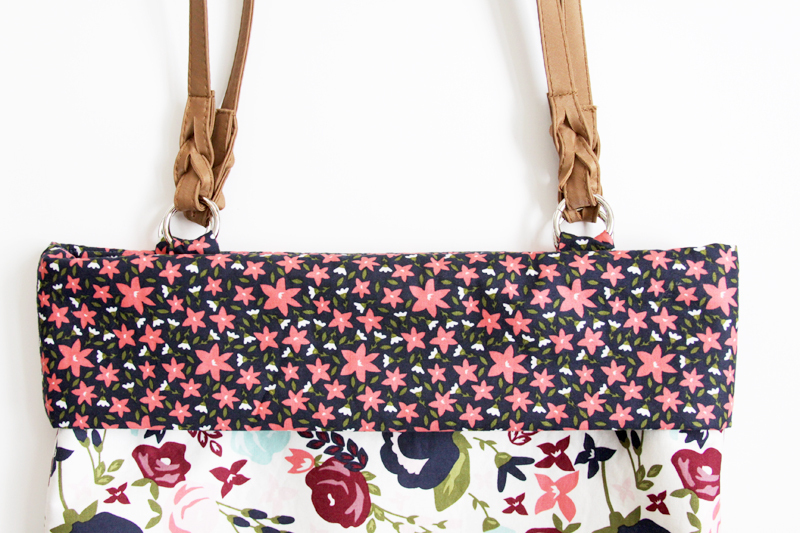 Aren’t the florals in this fabric pretty?? I’m kind of dying over that large print. I love how it looks contrasted with the faux leather too! It’s tough to sew leather but a little washi tape makes it lots easier. Add pieces of washi tape to the underside of your presser foot (make sure to leave the opening uncovered so the needle can get through) and add pieces of washi tape to the plate of the machine, where the fabric will pass through. 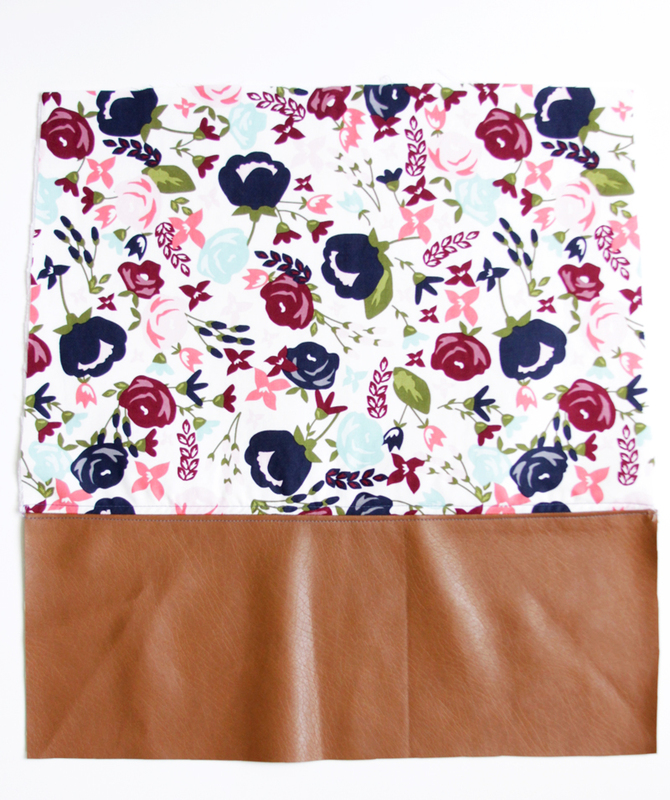 Iron the 16″ x 12″ fusible fleece pieces to the wrong side of the outside bag fabric. 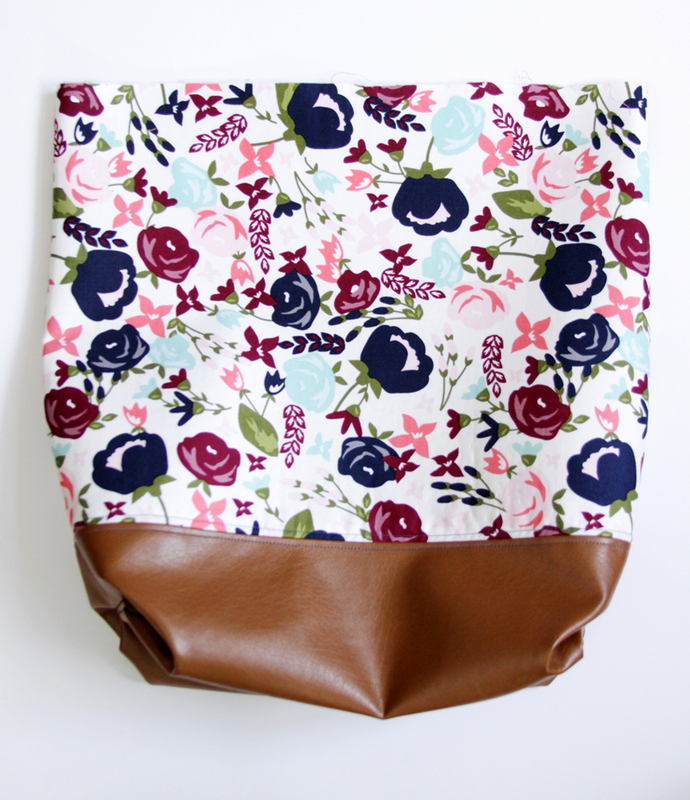 Match up the 16″ bottom side of the outer fabric with the 16″ side of the leather piece. Sew the pieces right side together, repeat for the other outer piece. 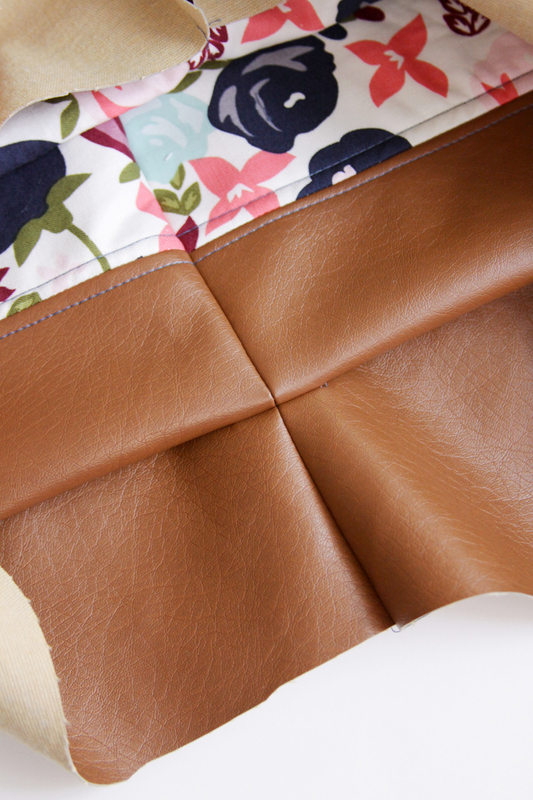 Press the seams open – you’ll want to use a pressing cloth so you don’t damage the leather. Top stitch both sides of the seam. Place the two outer pieces right sides together and make sure the seams are matched up. Sew the side seams with a 1/2″ seam allowance. 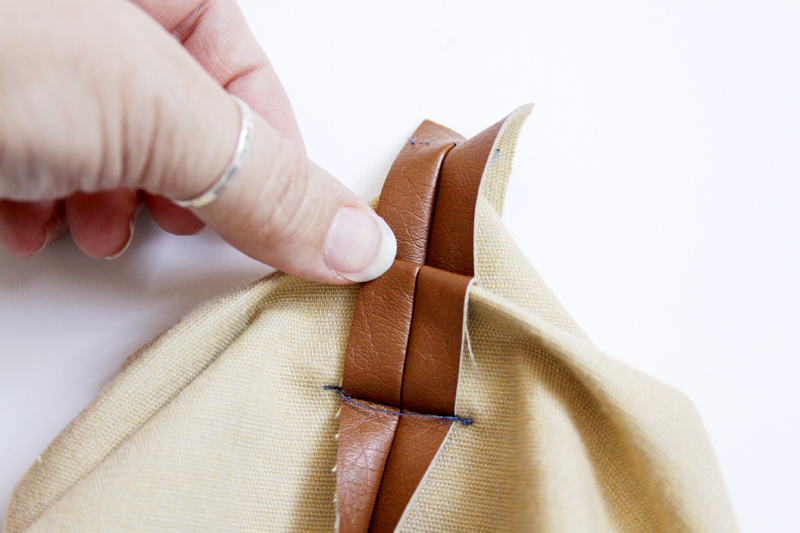 Make a pleat in one side of the leather by measuring down from the fabric and leather seam 3″. Fold the leather in half and match up the seams. Sew across the seam on the wrong side, backstitching at the beginning and end. This is what it looks like on the right side. Repeat for the other side of the bag. With the right sides together, sew up the bottom seam. Fold the bottom and side together at the corner with right sides together, right up to the point of the first pleat. Sew across the seam, just above the first pleat line. Do this for both corners. Here’s what it looks like on the outside. Carefully press your side seams open. Now on to the lining! Iron the fusible webbing pieces to the top section of each of the lining pieces. Fold each of the aqua fabric pieces in half to make 9″ x 5″ rectangles, right sides together. 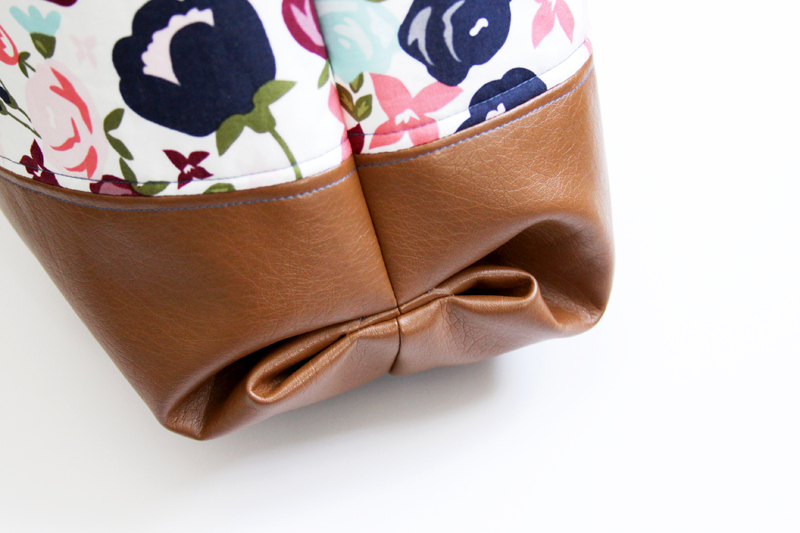 Sew around the sides and bottom, leave an opening about 2″ in the bottom. Repeat for the other pocket. Turn them right side out and press. Measure up from the bottom of the lining piece and place the top of the pocket here, in the center of the lining panel. 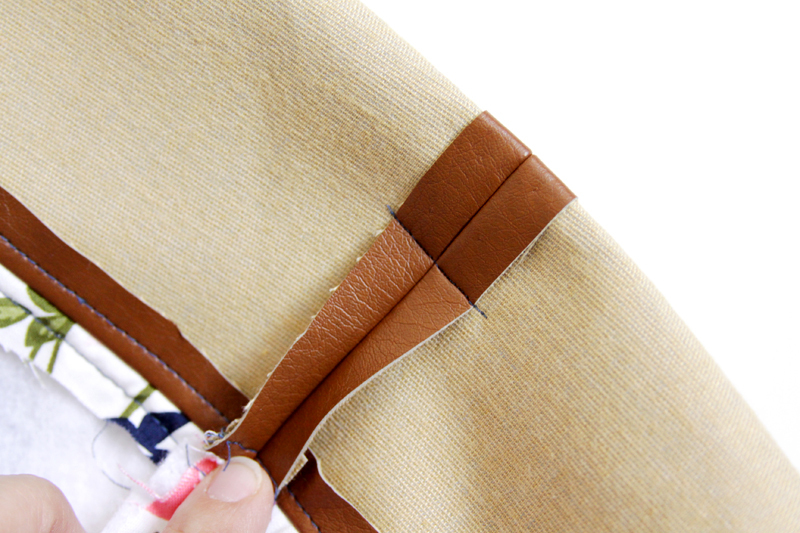 Sew around the sides and bottom of the pockets, sewing the opening closed at the same time. (You’ll sew a pocket to each lining piece. Place the lining pieces right sides together and sew around the sides and bottom of the lining. Leave an opening in the bottom seam 4″ long. Fold the corners of the lining together to make box pleats. Sew across the corners 3″ down from the points. Tuck the outside of the bag inside the lining, with the right sides together. 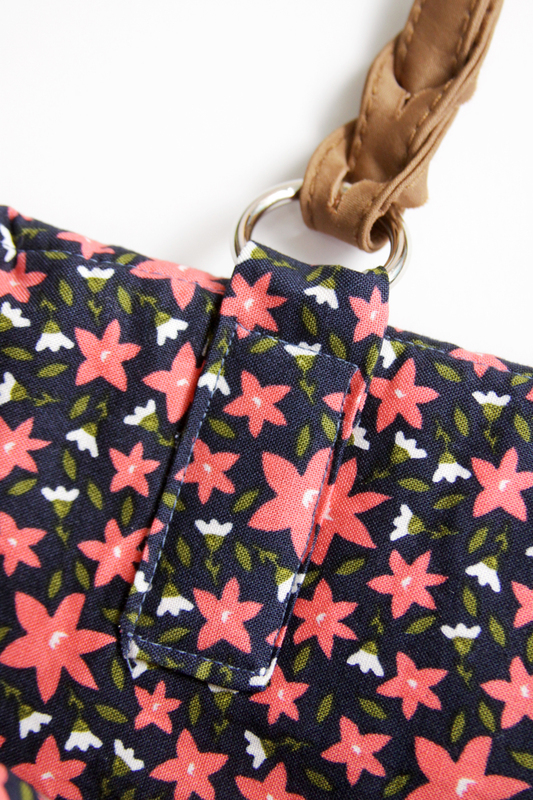 Match up the top edges and sew all the way around the top with a 1/2″ seam allowance. Turn the bag right side out and tuck the lining into the bag. Hand sew the opening closed. The lining should stick up from the top of the outer fabric 3 1/2″. Press everything. Topstitch the lining in to the outside fabric, just below the seam from outer fabric to lining fabric. Sew up the strap holders. 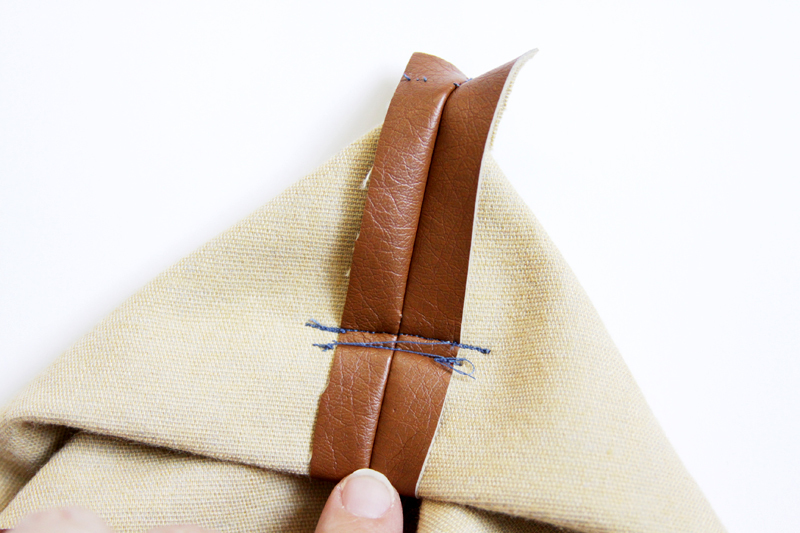 Fold the 3″ x 5″ pieces in half longways, then sew down the long side and one short side. Turn right side out and press. Fold the strap holder over one of the rings of the handles. The front side of the handle holder should measure 3″. Measure in from the side seam on the lining 3 1/2″ and line the fold of the strap holder up with the top of the bag (where the lining folds over). 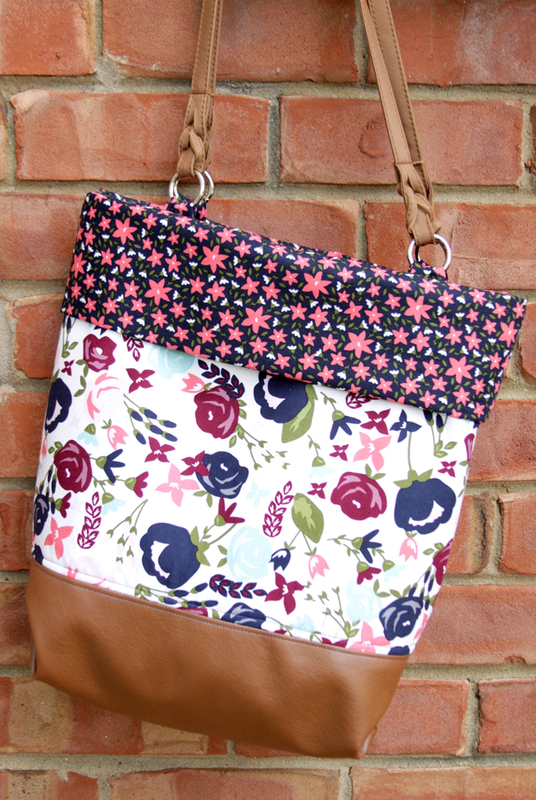 Sew around all four sides of the strap holder, sewing down the back side at the same time. Repeat for the other ring of the handle. Repeat for the handle on the other side of the bag, making sure everything lines up. That’s all there is to it – and now you have a cute new bag to carry! 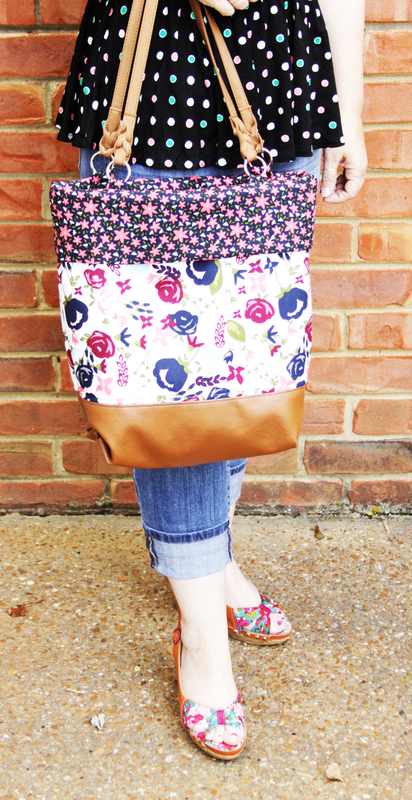 You can check out all the other fabrics in the Posy Garden line at Riley Blake, and all the stops on the blog hop here! 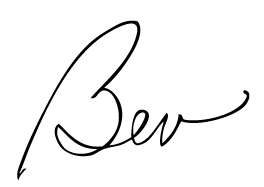 Well done Bev! Very classy touch with the leather! Uber darling! 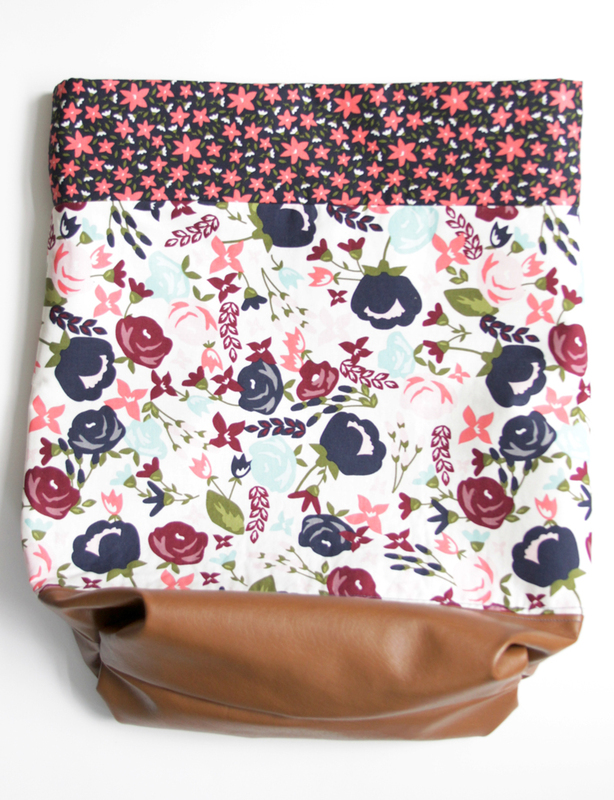 I think Riley Blake’s fabrics are seen more in the making of totes than any other!!!!!! Great tutorial!!!! Very nice! I do love a fun totebag. The fabrics you picked add a nice fall-ish look. Love it! 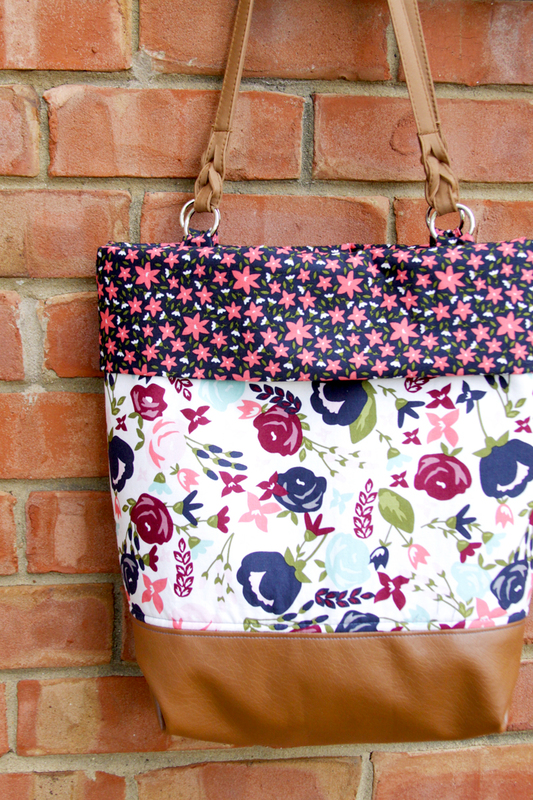 This is so pretty – and you’re so talented with sewing! 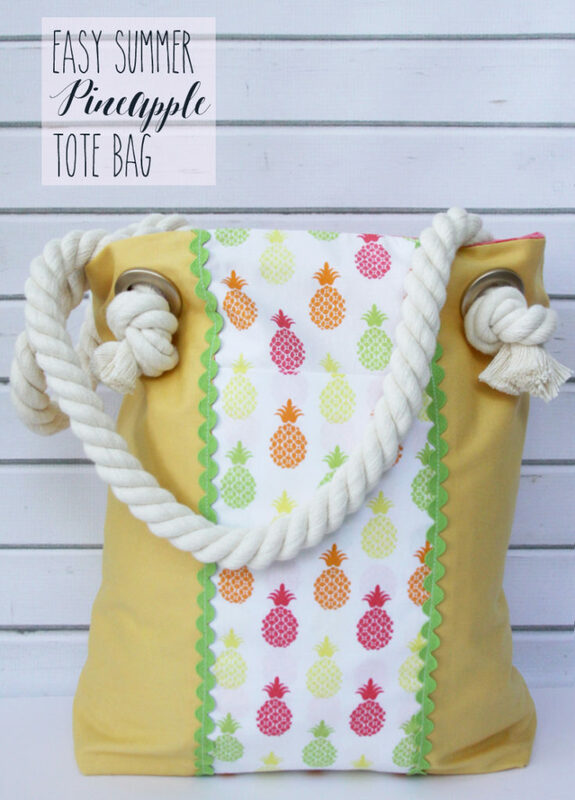 Your tote is pretty! It looks so well crafted and the combination of materials really makes it pop. Pinning. Thanks for sharing at Snickerdoodle! 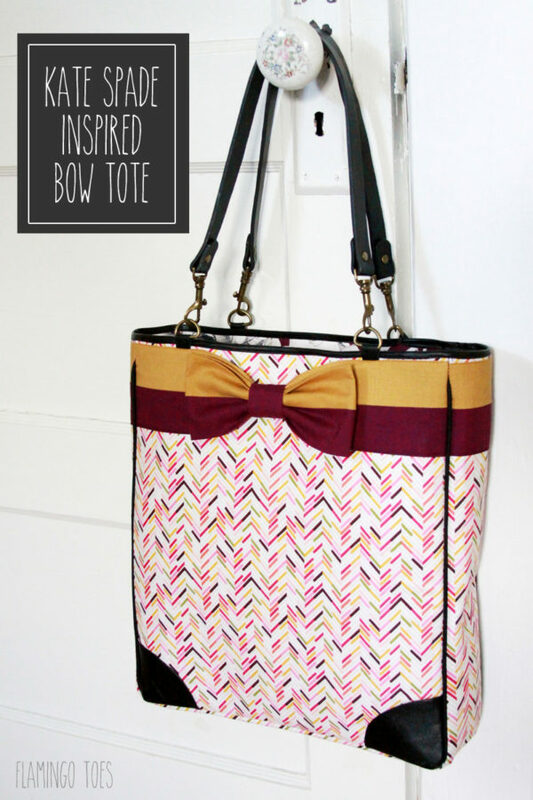 I can sew but never made a purse. Great job! Thanks for sharing on Family Joy Blog Link-up. Please come back and join us again!